If I showed you pictures of an astronaut, a dog and a waitress would you be able to name their patron saints? If I asked you to name any four doctors of the Catholic Church could you do it quickly and without hesitation? 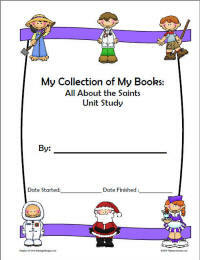 I hope that you would have answered St. Joseph of Cupertino for astronauts, St. Roch for dogs, and St. Martha for the waitress, but if you didn't then our All About the Saints Mini-Book Unit Study might be a fun project for you and your family or religious ed. or CCD classroom to complete together. If you have never completed one of our Mini-Book Unit studies before you will find it to be a fun and engaging project for learners of all ages. One year I did the study right along with my kiddos. We had fun and I was surprised at just how creative we can be with only eight little pages per book. 1. Download the unit. It is a zipped file and you will need to unzip it as it contains many files including the mini-books, instructions, listings of the Doctors of the Church, Keepsake memory pages and unit cover sheet. 2. Print out the individual files. Instructions are given on the first page of the unit file. Books should be printed on regular paper. 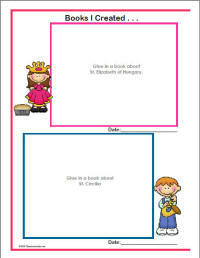 Memory pages are designed to be printed double-sided on cardstock but will work single-sided as well. We use cardstock so that when our little books are attached the pages will be sturdy. 3. Assemble the unit pages. Bind memory pages using a comb binder, 3 ring binder, duo tang, or other binding of choice. 4. Create the mini-books. Have children create books through writing and/or drawing as they learn from resources from your own home, your parish library, the local library, the Internet, text books, videos, etc. about the highlighted saints. The printable mini-books in this unit study are prompted and require learners to research and fill in basic information about the featured saint including such things as when and where they lived, their patronage, special symbols, and when we may find their intercession necessary and helpful. Feel free to let learners take real ownership of their projects by allowing them to make it as fancy as they like using coloured pencils, crayons or other art supplies. A good dictionary and thesaurus are great tools to give them as well as they encourage the use of new vocabulary and accurate spelling. 5. Attach the mini-books. Affix mini-books to the keepsake pages in their proper place. There is a designated spot for each book. In some units you are free to rearrange the order of the keepsake pages to meet your family's needs. Be sure to mark the date in as well as your learner is sure to come back to this finished project over and over. Learn more about or download our All About the Saints Mini-Book project now.